A quality door makes a statement on the overall style of your home whether it be an external or internal door. It is therefore important to make sure you choose wisely. Your decision on which type of PVCu door to select will be governed largely by its position in your home. Here at Bootle Glass we offer a wide variety of door designs incorporating many different panel styles, whether solid or part-glazed, to complement the architectural style of your home perfectly, from classic sturdy entrance doors to elegant French doors or patio doors. Give us a call and we can arrange to show you the full range of doors available. We will be happy to help you to choose a design that complements the architectural style of your property as well as the configuration of your windows. Composite doors are made from synthetic material that has the look and feel of a wooden door. These doors are made from different materials which are moulded together to make them strong and durable. Composite doors have a reinforced to coat that gives them the look of grain finish. The skin also provides a strength to the door which cannot be opened by force or strong kicks. Composite doors never need painting or varnishing as they don’t fade with time. The core of these doors is filled with foam which can provide 6 times better insulation than wooden doors. Also, these doors do not twist, warp, crack or swell like traditional wooden doors do. All these attractive and useful features are now available at a much affordable price than the expensive wooden doors. They are great entry doors, back doors and front doors for your home. Composite doors are the most recent development in the door market. On first appearance it is difficult to distinguish a composite door from a conventional hardwood one. The composite doors we offer are good looking, robust, weather resistant, carry a lengthy product guarantee and are available in a choice of styles and colours to complement your property perfectly! Here at Bootle Glass we carry an extensive range of composite doors so why not contact us and check out what colours and styles are available. Imagine throwing open your French doors on a warm evening and strolling into the garden with a glass of chilled Chardonnay in your hand. 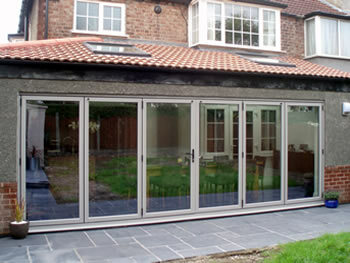 Or sliding back the patio doors to let glorious sunshine stream into your home on a fine day in high summer. Nothing enhances a room like French or patio doors. They let in more light and enlarge the feel of the room. And they help to make your garden a natural extension of your home. 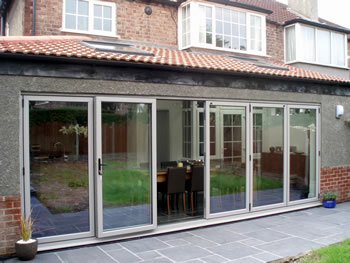 Bootle Glass are delighted to offer a wide range of French and patio doors. We can also provide fully glazed or part glazed sidescreens for wider entrances with the option of a central midrail for letter boxes. Why not go that extra step and make a whole wall into a window / door. 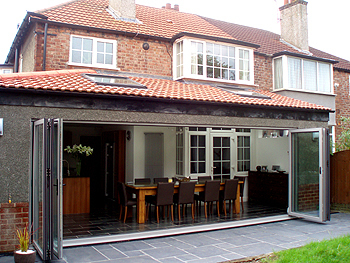 No matter what the weather you can extend your house into the garden by letting the outside in via a sliding / folding door. The doors can be opened independently, as a section or as a whole wall. Perfect for the house that entertains a lot! Give us a ring and we can discuss the options available to you. Why not go that extra step and make a whole wall into a window / door. 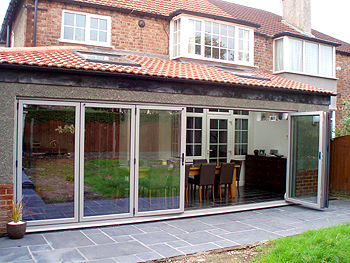 No matter what the weather is like you can extend your house into the garden by letting the outside in via a sliding / folding door. The doors can be opened independently, as a section or as a whole wall. Perfect for the house that entertains a lot.